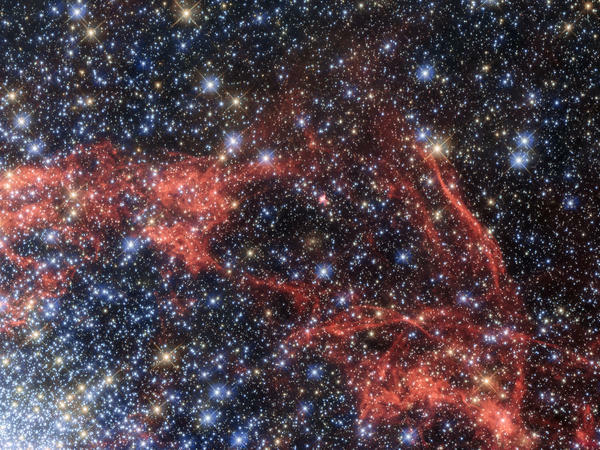 This image, taken with NASA's Hubble Space Telescope, shows the supernova remnant SNR 0509-68.7, also known as N103B. It is located 160,000 light-years from Earth in a neighboring galaxy called the Large Magellanic Cloud. As the fox told the prince in Antoine de Saint-Exupéry's wonderful fable The Little Prince: "What is essential is invisible to the eye." If the fox had not been talking about love, she could have been referring to the elementary particles of matter, the building blocks of everything that exists. The poetry here is in knowing that the world is made of tiny, invisible bits of stuff that carry, in them, the story of creation itself. You, your cells, are made of remnants of stars that died billions of years ago, before the sun and planets were born. If you think being 50 is old, think again! Scientists put a lot of effort into uncovering the history of these tiny bits of matter, in the hopes that it will tell us something about the universe and the amazing things that happen in it, from exploding stars and black holes to the origin of life itself. Of all the known particles of matter, the most elusive are the neutrinos. The name was given by Italian physicist Enrico Fermi, who figured they were just like small neutrons: in Italian, piccolo neutron — or neutrino, for short. Neutrinos come in three types, linked to sibling particles: the electron has the electron neutrino; the muon, the muon neutrino; and the tau, the tau neutrino. As their names indicate, they have no electric charge and a tiny mass. We don't know what their individual masses are, but do know that the sum of the masses of all three is very small, about 30 million times smaller than the mass of a single electron. We also know that neutrinos interact very slightly with other particles, making them very hard to detect. In fact, they are often called "ghost particles" for this very reason, as they can go through people, walls and even planets as if they weren't there. A remarkable fact: Per second, about 1 trillion neutrinos coming from the heart of the sun go right through you — and you have no clue this is happening. Their small masses and very weak interactions make detecting neutrinos a challenge. To find them, you need a vast receptacle of matter and hope that, every once in a while, one neutrino will strike a molecule of the stuff and create some sort of signal. The Super-Kamiokande detector in Japan is made of a huge stainless steel cylindrical tank 139 feet by 129 feet in size, holding 50,000 tons of ultrapure water. When a neutrino hits a water molecule in the tank, the flash of Cherenkov radiation is detected by one of the 110,000 photo-sensors lined along the detector walls. To avoid interference from other sources of radiation such as cosmic rays (particles that rain from the skies originating in outer space), the detector is buried 3,281 feet below Earth's surface in an old mine. I visited a few years back and was amazed by the whole experience. In this interactive video application, you can "travel" in the detector. A different kind of neutrino detector is the IceCube neutrino observatory, located at the South Pole. Like the Super-Kamiokande, the detector is also buried deep underground, in this case about 1.5 miles under the ice cover. Instead of liquid water, the targets here are ice molecules, although the idea is still to measure the Cherenkov radiation — albeit in a different setup. Neutrinos are produced not just at the heart of the sun and every other star, but also in more dramatic events such as supernova explosions, collisions between stars and neutron stars — and the Big Bang. Having such enormous detectors have allowed physicists to do "neutrino astronomy," essentially mapping the sources of very high energy neutrinos to learn something about the very dramatic events that can generate them. It is amazing that we call these devices buried deep underground "telescopes," but that is exactly what they are. Neutrinos from supernovae, and also the fact that the three types of neutrinos can morph into one another in flight — what is called "neutrino oscillations" — have been observed on many occasions already. The hunt is on for the highest-energy neutrinos out there, with energies that are a factor of 10 larger than the collisions produced at the Large Hadron Collider, the giant particle collider at CERN, the European laboratory for particle physics. Being able to probe physics at such enormous energies promises to open new windows for our understanding of the properties of matter particles and their interactions. Given the bizarre nature of these ghostly particles, we should expect some big surprises ahead. That tends to be the case every time science opens a new window into the invisible realm that surrounds us.